PAX® Technology’s SP30 PIN pad fits comfortably into the palm of your hand and offers security and reliability. It redefines the PIN pad. PAX's SP30 fits comfortably into the palm of a hand, offering everything merchants could want in a sleek, stylish payment device, providing unsurpassed security and reliability. It redefines the PIN Pad. The SP30 provides the smallest footprint with the largest user interface – 128 pixel x 64 pixel LCD with 4 lines of display – to ensure perfect readability and better branding opportunities. The high-speed processor and large memory support a broad range of payment and value-added applications. 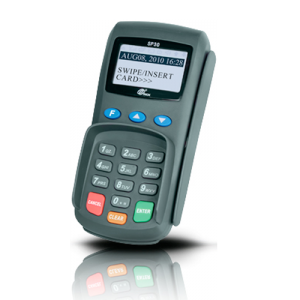 The SP30 offers options for adding a contactless card reader, magnetic card reader, and IC card reader. Simplified connectivity for any environment lets merchants choose from USB, serial or Ethernet connectivity. When connected to an ECR or POS terminal, the SP30 is the perfect device to streamline your electronic payment system.